If you choose the Lists→Customer & Vendor Profile List command, QuickBooks 2012 displays a submenu of commands that you use to create some of the mini-lists that QuickBooks uses to ease your bookkeeping and accounting. The Profile Lists include lists of sales reps, customer types, vendor types, job types, payment terms, customer messages, payment methods, shipping methods, and vehicles. Most of the Profile Lists are pretty darn simple to use. For example, if you choose the Sales Rep List command, QuickBooks displays the Sales Rep List window. You then click the Sales Rep button and choose New. 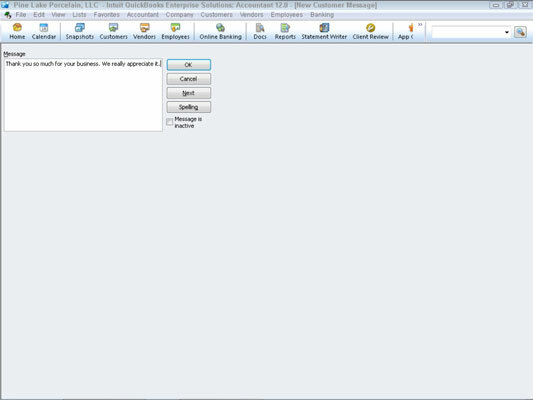 QuickBooks displays the New Sales Rep window. In case you’re still experiencing a certain amount of accounting anxiety, you simply enter the name of the sales representative into the Sales Rep Name box. Then, throwing caution to the wind, you enter the sales rep’s initials into the Sales Rep Initials box. When you click OK, QuickBooks adds the sales rep to your Sales Rep List. The other Profile Lists work in the same, simple, scaled-down fashion. You choose the Profile List in the submenu, click the Profile List button, and choose New. When QuickBooks displays a window, you use one or two boxes to describe the new Profile List. Just to prove to you that this really is easy, take a look at the New Customer Message window (accessible from the Customer Message List). This is the window that you use to create a new customer message. You can place customer messages at the bottom of customer invoices and credit memos. If you want to track vehicle mileage within QuickBooks — and note that you usually must track business vehicle mileage in order to claim business vehicle expenses as a tax deduction — you can maintain a list of business vehicles using the Vehicle List. This list then lets you easily track your business vehicles — something you do by using the Company→Enter Vehicle Mileage command. QuickBooks may also provide access to other lists using the Lists menu. For example, you can access templates you create for invoicing and other forms by using the Lists→Templates command. And QuickBooks may, depending on how you’ve installed the software, add lists not mentioned here. For example, depending on your installation and the state where you operate, QuickBooks may display a list of Workers Compensation items.